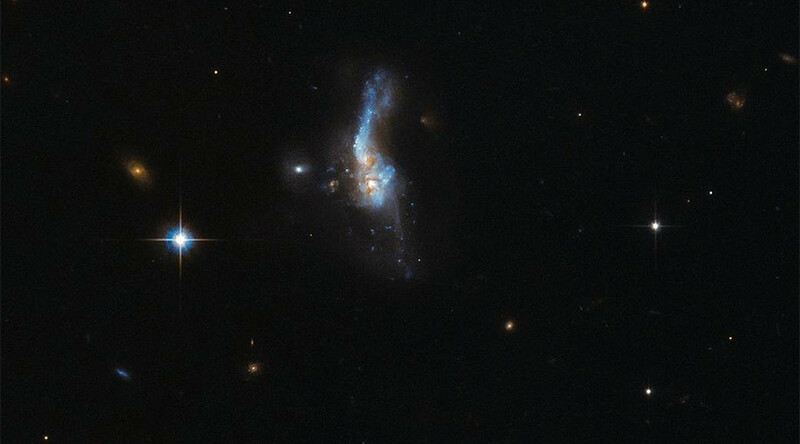 A smudge in space is more than is seems as the Hubble Space Telescope captures on camera the collision of two galaxies. The beautiful image reveals two gas-rich spiral galaxies as their destiny slowly unravels. Named IRAS 14348-1447 after the Infrared Astronomical Satellite (IRAS) responsible for its discovery the celestial object is the violent meeting of millions of stars after a gravitational tug of war created when they veered too close to each other. Located over a billion light years from Earth, IRAS 14348-1447 is known as an ultraluminous infrared galaxy, shining brightly in the infrared part of the spectrum. The huge amount of molecular gas present give it a whirling appearance, with tails and wisps. In November last year another galactic collision was captured by the Atacama Large Millimeter Array radio telescopes in Chile. A galaxy known as IC 2163 glanced off another named NGC 2207 creating a violent but beautiful formation 114 million light years away.